I have a date with my husband on Friday night. We are going to The Cure's reunion show in the city and spending the weekend at home, alone, for some much needed R & R. My in-laws will have the boys from Friday until Monday. I made these little 3 x 3 cards for the boys to receive each morning that we are not with them. Just a little something, so they know we are thinking of them. And a little something for me not to feel AS guilty for leaving them. I'm leaving tomorrow & probably won't post again until next week. This is a card I made for my husband for Father's Day. 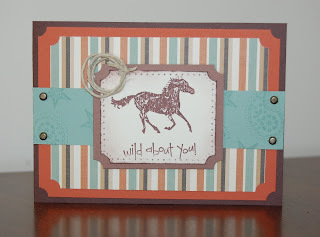 I used the stamp sets "Wanted" and "Wild about you". 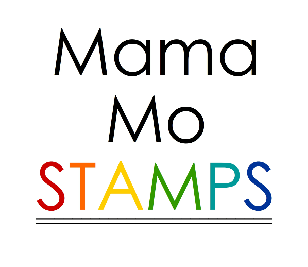 I don't have a Father's Day stamp, but I think the sentiment is fitting for the occasion anyway. We are going to be spending the day at Bushkill Falls. Our area is surrounded by waterfalls, and Bushkill Falls is one we haven't explored yet. But first my Hubby has to mow the lawn, poor guy, really relaxing, right?!? I made this as part of a theme "tone-on-tone" for the card club I've only been able to attend once. At least I'm coming up with samples to play along! It seems a little bit dark to me, like I need something else to make it POP! And, this picture is awful. I don't know why it cam out so dark!! 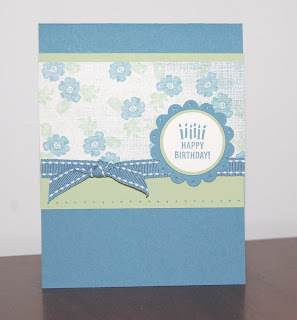 I've made this card before, just using different dsp and colors, I still love it. 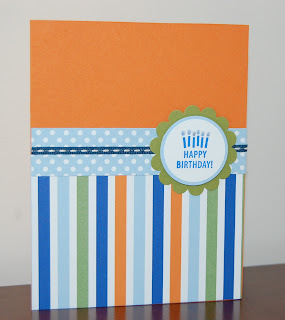 It's super simple and can be used to make a card for ANYONE, just change up the colors a bit!! It's a great design to fall back on when your short on time. I decided to try the Splitcoast color challenge this week. And a challenge it was!!! This color scheme is sooooo outside my comfort zone. The challenge was to use so saffron, regal rose and real red. I'm pretty pleased with how it turned out. They only problem is that I don't know anyone that is expecting a baby, and I seem to be surrounded by boys. I guess I'll add this one to my stash. Has it really been this long since I posted? I am definitely slacking, although I have been stamping!! 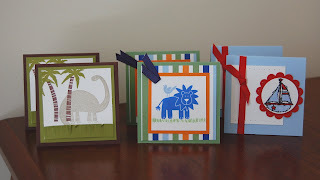 I made these cards for the newest addition to our family, Lucas Andrew, born to my cousin and his wife last week. 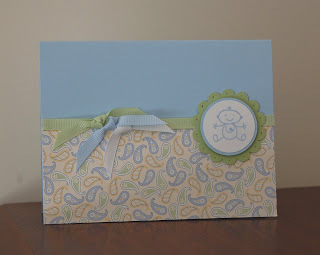 The first card is for the new parents, the second is for the new Grandma!! 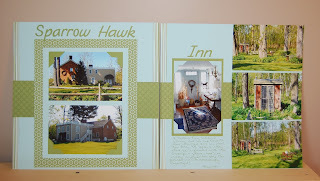 The colors and layout for this project were inspired by a layout that appeared in the January issue of Scrapbooks Etc. I've been doing a lot of winter layouts lately and was getting tired of using the same colors over and over again. I needed something new and fresh, so I grabbed some magazines and started the search for something new-to-me and bright. I really like the way it came out!! It makes the pictures pop off of the page!! 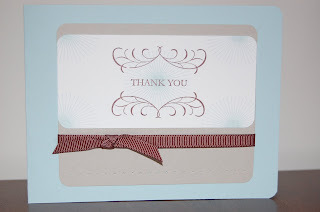 I've recently been introduced to group of ladies that get together monthly for breakfast and a card swap. 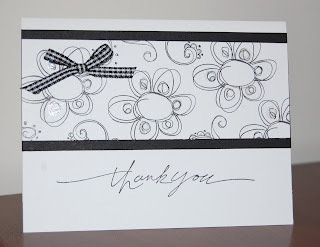 This months theme is black and white cards. Here's what I came up with. I decided on a simple layout this time. Last month the card I made was way too involved and had way too many layers. I wanted to do something I could replicate quickly and easily. I never had any intention of buying this set. Yes, it's cute. Yes, I have two boys. No, I still wasn't going to buy it. Until my five year old started professing his love for it. "Boy Mommy, I really love those dinosaurs" "Can we do a stamp camp with those dinosaurs Mommy?" On and on and on...every time I have out the catalog the questions about the dinosaurs begin. So, I gave in. I have to admit, they are cute, aren't they? And I will probably use them a lot for little boy birthdays!! Happy Mother's Day to all of you Mom's out there!!!! Sorry for the dark picture, it's been a bit gray here!! So, I've been less than productive lately. I had really been on a roll and now I have nothing to share!! I don't think that I ever posted this on my blog. It was a sketch challenge I participated in a couple of weeks ago. And, Happy Mother's Day to all of you Mom's out there!!!! Quick post today. Sharing with you today what will probably be the first layout for our 2008 album. A beautiful winter morning!!! 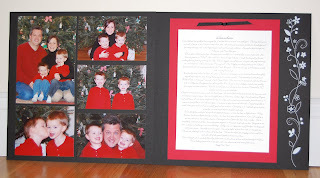 This will be my last pages of our 2007 family scrapbook. I think I'll end each year this way. On the left I have pictures of us from Christmas day and on the right I've written a review of the year, our accomplishments, our favorite things, trips and anything else that I think is important for us to reflect on. Of course, once the page was complete, I thought of other events I should have mentioned, like my Mom and her boss winning the lottery - duh!! I will have a special page dedicated to that, so it won't be forgotten (sorry Mom!) I don't always do a ton of journaling so this will be a good way to be sure I've touched on all of the important events of the year. This is a very simple layout. 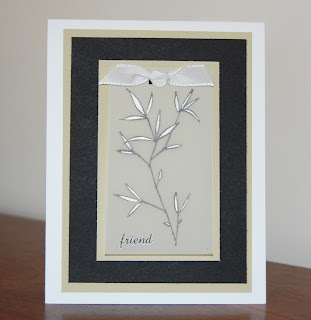 I used the crisp color combination of basic black, whisper white and real read. With just a couple of accessories and rub-ons (sale-a-bration '08), I think it's a nice way to end off our year!! We are going away this weekend for my husbands 20 year high school reunion. I won't be posting again until Monday. 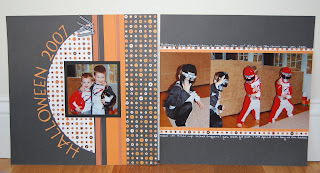 Check back then for another scrapbook page. Have a great weekend!! 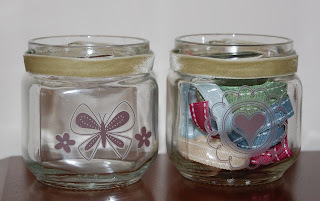 This is the stamp camp project I have planned for June. Please read below for the particulars. Date: Sunday, June 8th 11am. 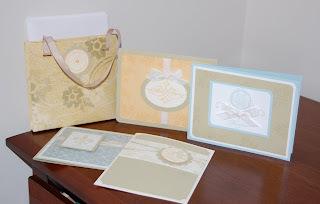 This stamp camp project is to make a double-pocket bag with 4 coordinating cards and envelopes. 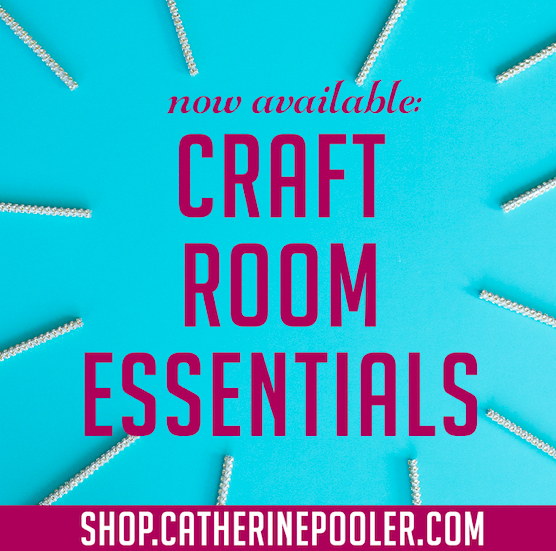 It is the perfect gift for anyone or just to keep for yourself. 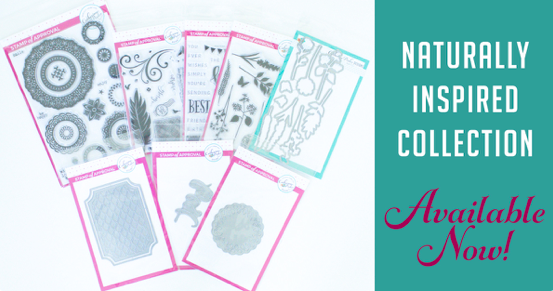 We will be using the designer series paper, le jardin, and the coordinating stamp set Carte Postale. The stamp camp fee is $15. This stamp camp project will also be available by mail. More to follow about that option later! So, my boys are turning into party animals. They are going to ANOTHER birthday party this weekend, boy, what a life! That's three this month. 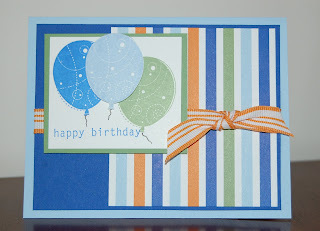 This is the card I made for the birthday boy. I've had the "Spring break" designer paper since February and was dying to use it. I just loooovvvee the color combination. I've also been wanting to pull out the "All in the family" and "Family Accessories" sets. Here they are, and I'm really happy with how it turned out!! I tried to make the little boy look like Jack (the birthday boy) and it does resemble him. I used staz-on jet black ink and colored the image using my blender pen and ink from the cover of my ink pad. I also used some soft sky ink and colored around the image, to make it look like sky. 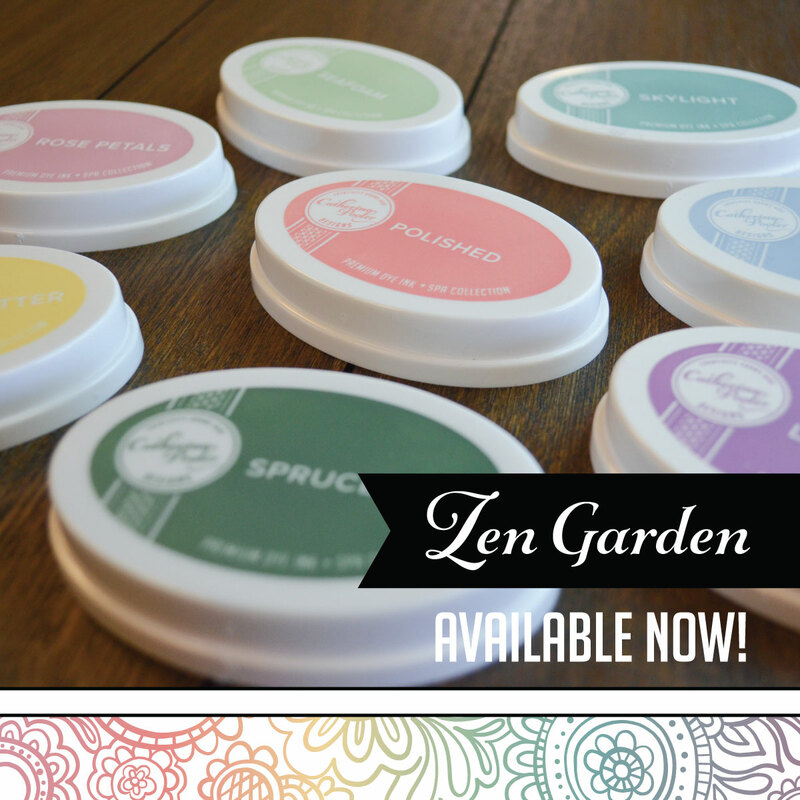 I know I've been counting the days until Spring and now that it is here, am I scrapping with beautiful pastels and stamping pretty flowers. No, I'm working on Christmas. Seriously though, can you blame me? Look at these faces. How could I not scrap these pictures? I have had this idea in my head since I took these pictures for our Christmas card. And it was so fun to finally scrap them. 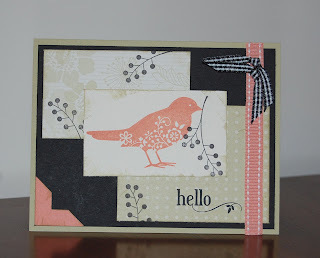 I'm back in the groove and loving scrapping right now. 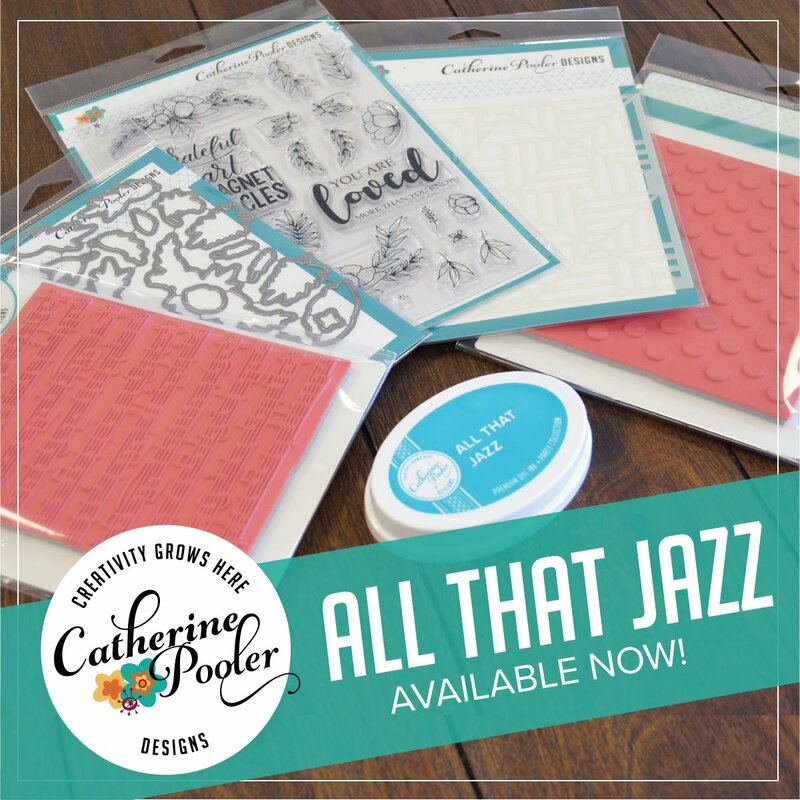 I would love to run upstairs and lock myself in my stamping room for the day. Unfortunately, laundry, dishes and two wild boys are stopping me from doing that. What do you have if you don't have dreams, right? I was FINALLY able to be creative yesterday. I used the splitcoast sketch challenge (sc172) to get my creative juices flowing. 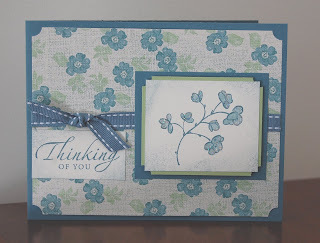 Not only did I create this card yesterday, I also completed a scrapbook page, whoo-hoo. I'll post that tomorrow. We're off to the party!! Happy 3rd birthday Ryan!!! Ok, so I haven't been the best blogger lately. On top of working my way through a bit of a creative block, I have been sick on and off since Easter. Every time I start to feel a little bit better, bam, I'm sick again. 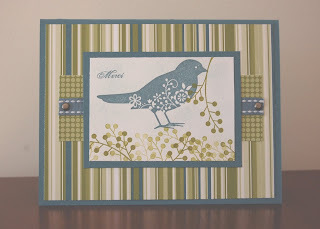 This is the 13th scrap layout I've done this year. I've completely lost track of how many weeks have passed this year, so much for my resolution...I guess that's why I don't usually make them. I do have hopes of catching up. 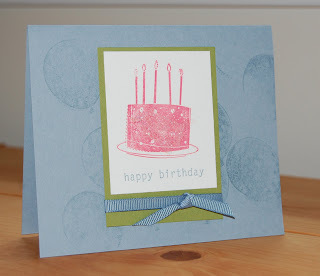 Doug is off tomorrow and all of next week, so I am hoping to get some creative time to myself up in my stamping room. This page is one I created for a workshop I did last Friday night. The hostess asked to do a scrapbook page (yeah), as it's her goal to learn to scrap this year. This is a progressive page. We started with a 6 x 6 page, turned it into an 8 1/2 x 11 then 12 x 12. I used barogue motifs, the baroque wheel and always. And, again, I used River Rock, basic black and whisper white...do you see a trend here? Very simple, very elegant and lots of fun. Thanks Jody! Other notes: The heart from Always was heat embossed and cut out with paper snips. 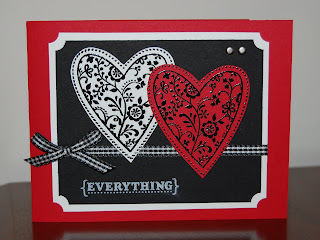 I also used the black and white gingham ribbon for the bows on the 6 x 6 page and the heart. 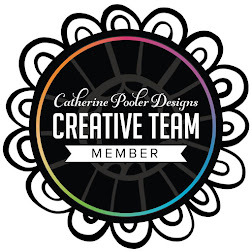 So, I think I'm having a creative block! Although I love the sketch challenges, I can't seem to come up with anything without a sketch! Usually my wheels are always turning, I have more ideas then time to create. Not the case right now!! This is my second attempt at SC170, and I'm happy with the way it came out. I love the combination of river rock, black and very vanilla. 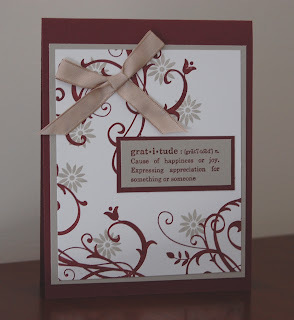 I used the ginger blossom designer paper along with the stamp set "Embrace life". To color the flower, I used ink from the cover of my river rock ink pad and my blender pen. 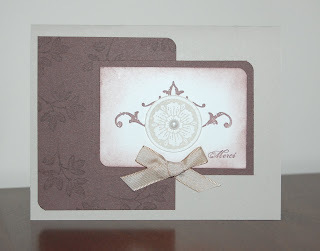 It's a fairly simple card with an elegant and classy look. It is for my Aunt's 60th birthday. Have a great weekend. I hope to have some more to share soon! 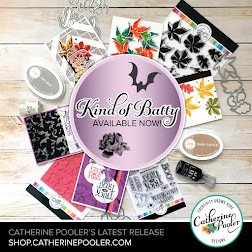 Although not a new set to Stampin'Up!, it's a new set to me. I've had my eye on this one for a while. I think this is the first time I've posted a card using it. I made this a couple of weeks ago. Since I haven't had one bit of energy to create lately, I thought I'd post this one. My voice is finally coming back, maybe the body aches are on their way out too!! 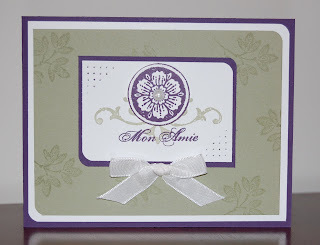 Mellow moss and elegant eggplant is one of the first color combinations I fell in love with. It's been close to a year since I've used them together. I think I fell in love all over again. I'll definitely be using this again soon! 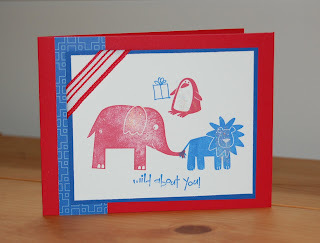 As promised, here is the card I made for my hubby's birthday. I used the Bursting with Joy set. I love how versatile it is!!! 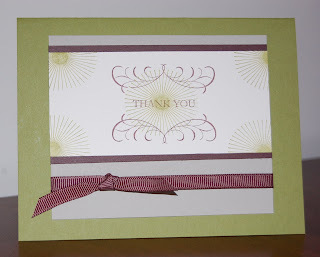 While blog-hopping the other day, I saw a post about vellum and I realized that I NEVER use my vellum. I guess I kind of forgot about it. 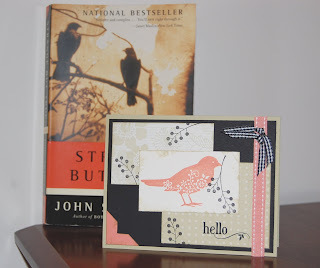 These are two cards I made using vellum. 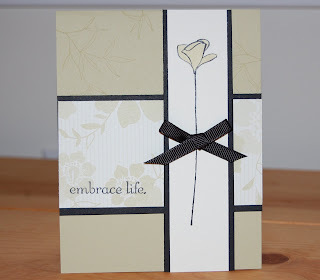 The first one uses the stamp set "Embrace Life". 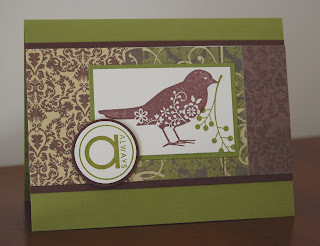 I stamped this image using staz-on black ink on vellum, and colored the leaves using my white gel pen. I used the double rectangle punch and threaded the white taffeta ribbon through it. The rest is just layers of whisper white, river rock and basic black and the cherished rub-on. 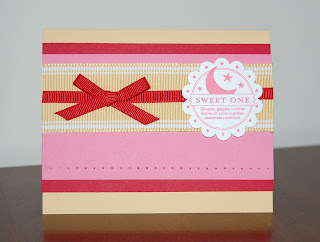 It's a very simple, yet elegant card. It may be hard to see the vellum in the second card. I just used it as a layer behind the bird. Can you see it? I find I use more vellum in my scrapbooks then on cards. 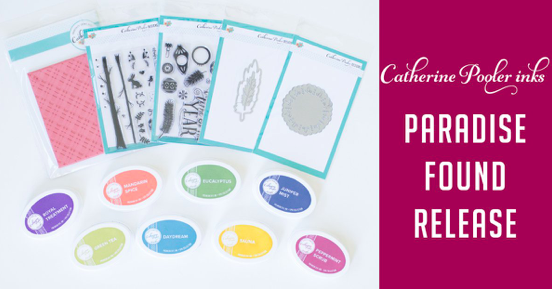 How do you use vellum in your crafting projects? I'm playing catch up! Only 2 more layouts and I'll be caught up! I know I only took these pictures a couple of months ago, but the boys have gotten so big since then! Especially Ethan, he looks so little in this picture. 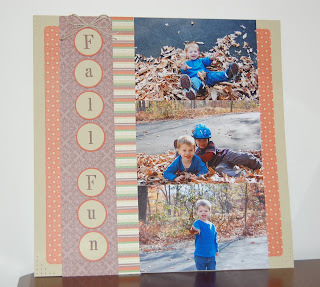 This layout was inspired by a sketch I saw while blog-hopping the other day. I didn't keep to the sketch but it has the same basic feel. I used my gel pen to journal above and below the pictures on the page to the right. Ok, so I'm officially behind! I did pretty well there for a while. For those of you who aren't frequent visitors to my blog, my goal this year is to complete 1 layout a week. I'm on week 11 and it's the 14th week of the year. Looks like I have some scrapping to do!! I just printed out a bunch of pictures, hopefully I'll get back on track soon. 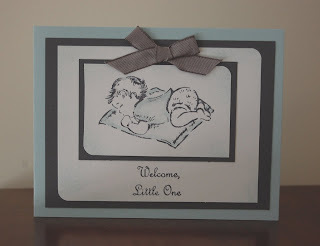 I used the Jersey print paper for this one, perfect for my Jersey born little boy! It seems like the bad news keeps coming for us. On Wednesday, my cousin Christopher passed away. He was only 35 years old. This is my first try at a color challenge. I've participated in the sketch challenges before and wanted to give the color challenge a try. When I first saw the colors: purely pomegranate, wild wasabi and so saffron (cc156), I never thought I'd be able to come up with anything. It's kind of bright for me! I knew I wanted to use "birthday whimsy". It was one of the sale-a-bration sets I knew I HAD to have, but I haven't picked it up yet! I'm pretty happy with the way it turned out. Cute for a kids birthday I think. I don't know if you can tell but I added some "bling" to the presents. It looks cute in real life. So, I've completely been inspired by the book I've been reading "Strange but True". I keep looking at the cover and thinking to myself, "What a great color combination". 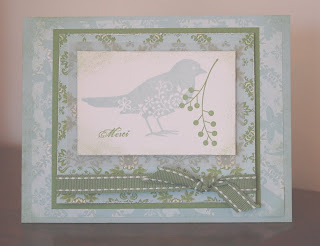 The birds reminded me of the bird from the stamp set "Always"(which is why I bought that set, I love that bird). When I went over to splitcoast last week and saw their sketch challenge (sc165)...BAM!! Inspiration!!! I LOVE the way it turned out. It's so NOT what I usually create but I am loving it! First, Happy March. I'm hoping that this is a better month then last. I'm glad it is behind us and I'm ready to move on!! Saturday afternoon I did a workshop for Donna. It was great fun. 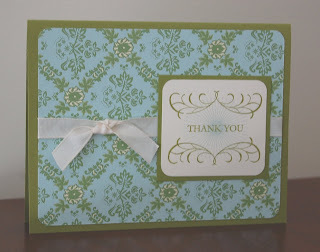 I love meeting new people that love stamping and seeing the excitment in their faces when presented with new "toys". This is the card the ladies made. 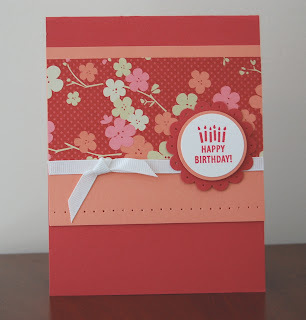 We used a lot of punches, ginger blossom cardstock and did some paper piercing. 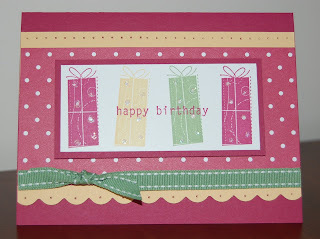 It's a fun, bright card. I love the combination of ruby red and groovy guava! It's been a while since I've scrapped a baby photo of Conner and figured it was time. 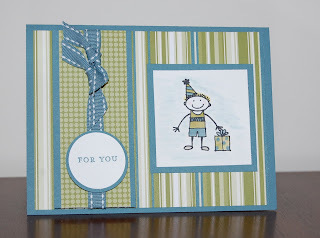 I used some chipboard and the stamp set "Always" on this page. 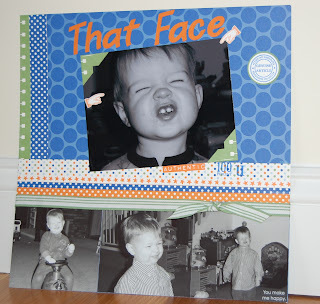 I have a hard time incorporating stamping into my scrapbooks and I am hoping to start doing that more often. 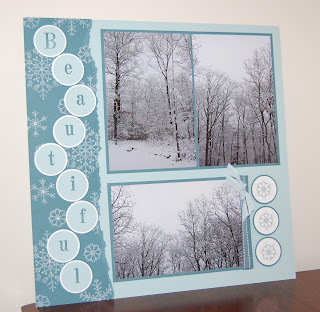 Here are two cards using similar but tweeked layouts as yesterdays card. 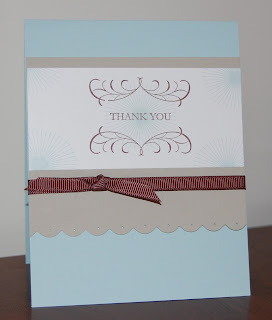 I wanted to show you how easy it is to change up a card just a little and give it a whole new look. I so love this set. I'm surprised that I haven't seen more people using it over at splitcoast. I'll have to use some of the other stamps from the set so you can see how versatile it is. I'll add the recipe later. Usually before I sit down to stamp, I have an idea in my head. I know what stamp set, colors, a sketch I'm going to use. I don't always stick to the plan, but it at least gets me started. Last night, I didn't have a plan. I knew I had to make thank you's but that was it. I figured I'd be upstairs for hours trying to come up with something. Then I spotted "Bursting with Joy" sitting on my shelf. It's a new set that I haven't gotten a chance to use yet. So, I pulled it out. Because it's such a beautiful set I didn't even need to much with it to make a nice card. This was a very simple card to make and will be easy to reproduce later tonight in hopes that I'll finally get out some thank you's. This picture isn't the greatest. Click on the card to see it enlarged. Ok, I'm all caught up. This layout goes along with the one I posted from Minnewaska State Park. I'm really happy with the way this one turned out. It hard to see here, click on the picture to get a better view. We had a wonderful weekend (after having an arguement with the innkeeper)! 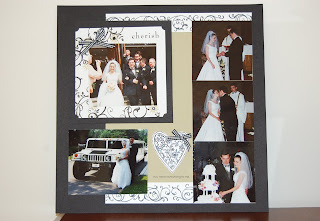 Scrapping these pictures made me want to take another weekend away with my hubby, away from all of this snow and ice!!! 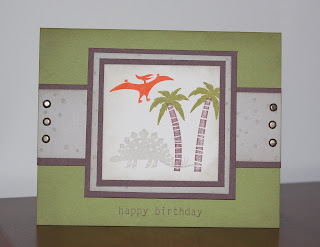 I got the idea for this layout from a sketch in one of Becky Higgins' books (I can't remember which one). Her sketches always help get my creative juices flowing. Our family has been completely wiped out for the past week by a NASTY virus!! 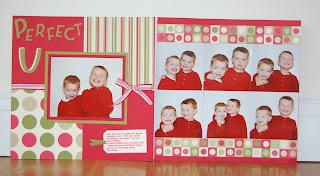 I do have 2 scrapbook layouts to show you and hopefully a card I plan to make today. Check back later, I should have something posted then! This is the card I made for my hubby. We are not big on Valentine's day, we don't usually go out for dinner or anything like that, but I wanted to at least make him a card. The inside is stamped with "you mean everything to me". 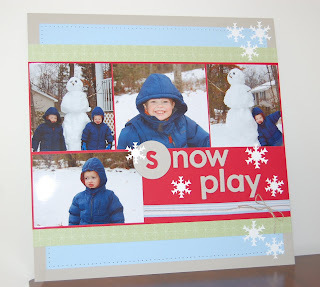 One good thing about being iced and snowed in yesterday was that I got a chance to play in my stamping room mid-day. What a treat. 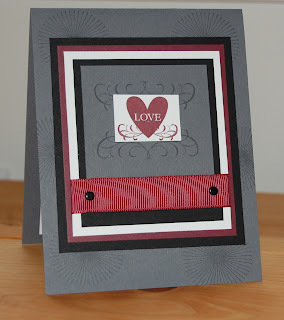 My stamping and scrapping time is usually after the boys go off to bed. I did enjoy having some time to play yesterday but I also had 2 little boys getting into all of my stuff. They each made their own creations but got more ink on themselves!! OK, so I'm not usually one who does altered items. I see beautiful things other people make and I just don't have that creative bug. These may be the only altered items you see from me this year! 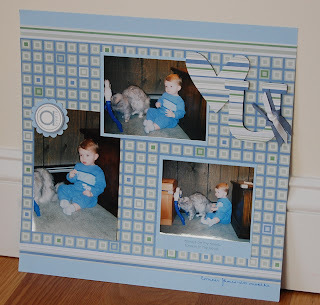 The first is a shadow box. 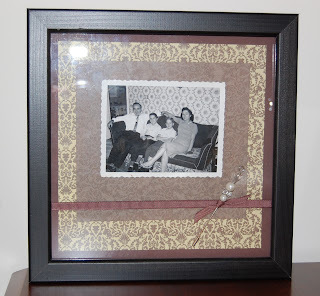 It's a picture of my Grandparents, Dad and Uncle taken many years ago. My Grandfather recently passed away and I brought this to the wake. It was actually my sister's idea, she also made one. When I get a chance I'll post hers. 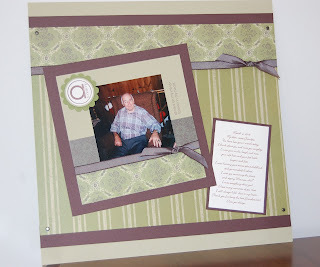 All it is is an 8 X 8 scrapbook page using the brocade backgrounds paper. Look how it matched perfectly with the wallpaper in the picture, AMAZING! I also added a bit of ribbon and a hat pin from the pretties kit. Two posts in one day...a record. Actually, we are getting yet ANOTHER winter storm. I figured I'd post early before I loose my satellite signal. My son Conner is turning 5 this weekend, I can't believe it!! This is the first card I've made for him. 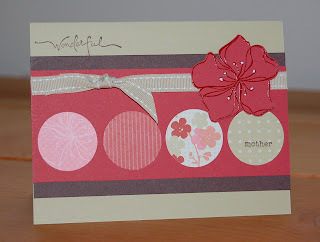 I don't know why though, I make cards for everyone else but I've never made a card for my own kids, hmmmm. The stamp set is the SAB set called "So Many Scallops". I don't know if you can tell in this picture but I added some dazzling diamonds to the candles. 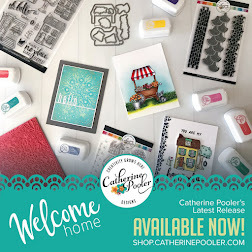 I finally got back to my stamping room. This is the first card I've made in quite a while! I am a bit rusty, but I think I pulled it off. 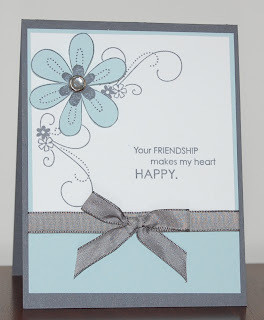 I used the sale-a-bration set "friendship blooms" and the new to me color basic gray and matching tafetta ribbon. What fun :) I love that the sale-a-bration (SAB) sets are die-cut. It makes them so quick and simple to mount. I wish all sets were die-cut!! I was also able to use some of the SAB rub-ons. I'll share what I did with those later!